As part of Lexus' ongoing effort to no longer make cars that are the automotive equivalent of taking a nap, they brought some truly crazy Lexus IS concepts to SEMA this year. But none are as nuts as this concept, which won a DeviantArt contest and netted its designer a very sweet prize. 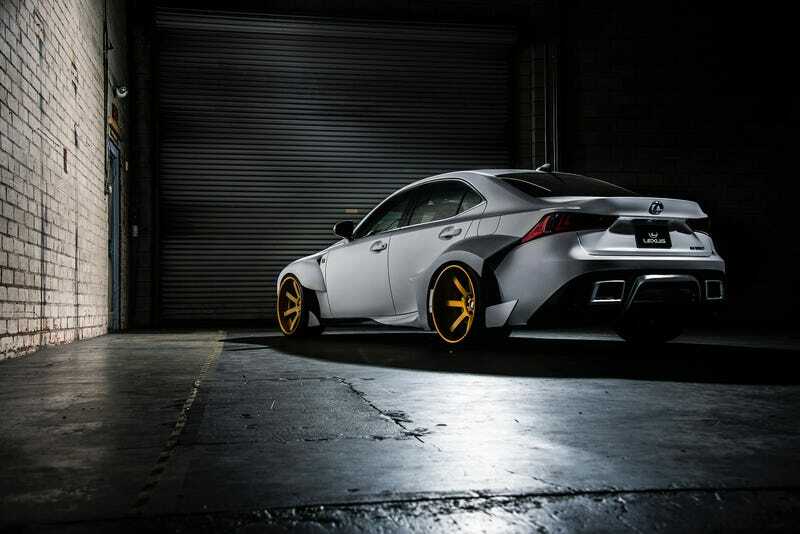 DeviantArt artist Robert Evans won the contest and got to see his wild IS 350 F Sport concept brought to life with a custom aero package and all sorts of performance goodies. VIP Auto Sport spent 10 weeks to make Evans' dream a reality. You like fender flares? It has ALL the fender flares. But it's not just for show, although there's plenty of that too. The concept also has Brembo GT brakes, a custom air suspension, unique one-off Nutek wheels, a custom paint job, Takata Racing Drift Pro LE seats and a Seibon Carbon interior package. For his awesome work, Evans scored a a one-year lease on a 2014 Lexus IS F Sport, $2,000 cash, a trip to SEMA to see his concept on display, as well as 8,000 DeviantArt points and a one-year premium membership to the site.